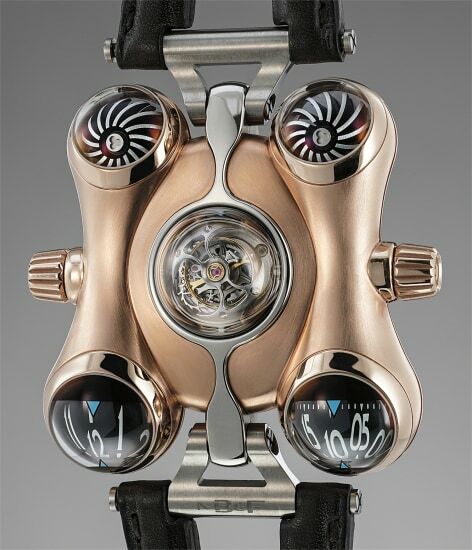 Since its inception over 10 years ago, MB&F has been bedazzling collectors and enthusiasts with their over the top, audacious and viciously cool and creative timepieces. Max Büsser, the brand’s founder and creative director conceives the Horological Machines (HM) not as mere timepieces but as kinetic sculptures for the wrist that can also indicate time. Inspired by the bulbous spaceship of Captain Flam (also known as captain Futuro) a Japanese cartoon character that was very popular in the 1970s-1980s, the HM6 is also nicknamed the Space Pirate. The entire shape and time telling of the watch is like no other, the shape is a surprising organic spacecraft that fits the wrist perfectly. Time is read via rotating spheres (hours on the left and minutes on the right). The top center features a lovely flying tourbillon that can be shielded or remain visible by turning the crown on the case side. Two turbines resembling spacecraft engines are placed on the back and rotate with the movements of the arm. They are in fact linked to the winding, by a gear train and amplify the number of rotations, thus making the automatic winding more efficient. The HM6 features 10 sapphire crystal domes, five on top of the watch and five on the back. Making domes of this size consistent with each other and with no optical distortions is a feat unto itself. The HM6 was made in only 100 pieces: 18 pieces in pink gold like the present watch, 50 in titanium, 10 pieces in sapphire crystal and platinum, 10 pieces in sapphire crystal and red gold, 4 unique pieces in the Alien Nation edition and 8 pieces in stainless steel. With the Horological Machines MB&F put the Extra into Ordinary. The HM6 is more than just a talking piece, it is a 475 component technical tour de force that took 4 years to develop and a timepiece that would be perfect for the free thinking collector looking for the unusual and beautiful.